Getting a bit sick of painting grey hulls on your Cruel Seas ships? This week, we’re looking at how some nations went about camouflaging their ships! The principles of naval camouflage are not so different from those employed on the land. Soldiers are taught to use scrub and deadfall on their helmets to break up their outline and conceal them from sight. Later in the war, many armies issued camouflage smocks to make their soldiers harder to detect. In the same way, camouflage can be used to disguise a warship’s type or direction of travel. By disrupting the vessel’s outline, it also makes targeting it more difficult. 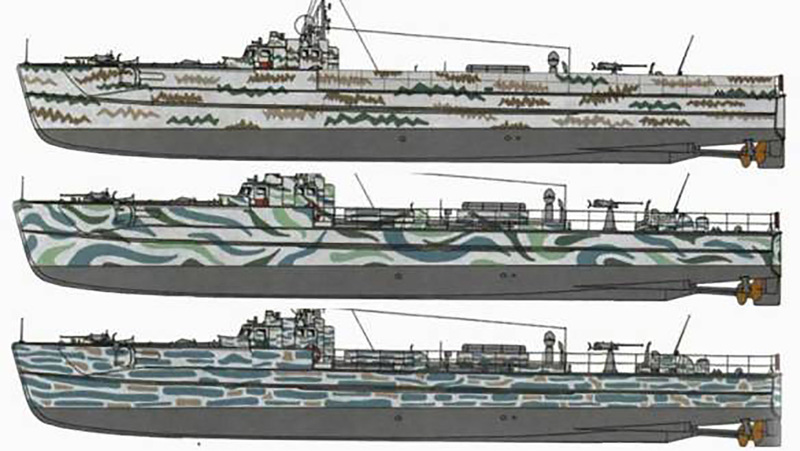 The picture of PT-170 shown above perfectly illustrates the principles of dazzle camouflage. The contrasting bands of parallel Black and white lines make it very difficult to discern the true shape of the ship, along with its course. MTB-30, a British Vosper painted with a two-tone camouflage pattern. MTB-30, pictured above uses a much simpler two-tone pattern using broad bands of light and dark grey to break up the ship’s outline at a distance. MTB-307 – a 77′ Elco in Royal Navy service, painted in a more organic-looking dazzle pattern. These more organic shapes are more reminiscent of traditional camouflage patterns but achieve the same effect as the angular dazzle pattern featured on PT-170. Both sides experimented with these elaborate patterns, as illustrated by this picture of an unnamed S-Boat. A Kriegsmarine S-Boat, showcasing an elaborate pattern of multicoloured splotches. These splotches would be a mix of greys, greens and blues against a background of ocean grey. In some instances, they would be painted the same shade of light grey against a darker background. We hope that we’ve showcased the range of camouflage used on fast attack craft during the second world war. When it comes to painting your ships for Cruel Seas, you can do as much or as little as you want. A few broad bands of a darker or lighter colour as seen on MTB-30 gives a nice visual effect for very little effort on your part. More pictures of Invisible Officer’s minesweeper are available here! With a steady hand and a bit of patience, you can create some fantastic looking models! Thes camouflage scheme for MTB 30 can be recreated using Army Painter Uniform Grey and Matt White. The scheme for MTB 74 can be recreated using Army Painter Uniform Grey, Wolf Grey and Matt White. 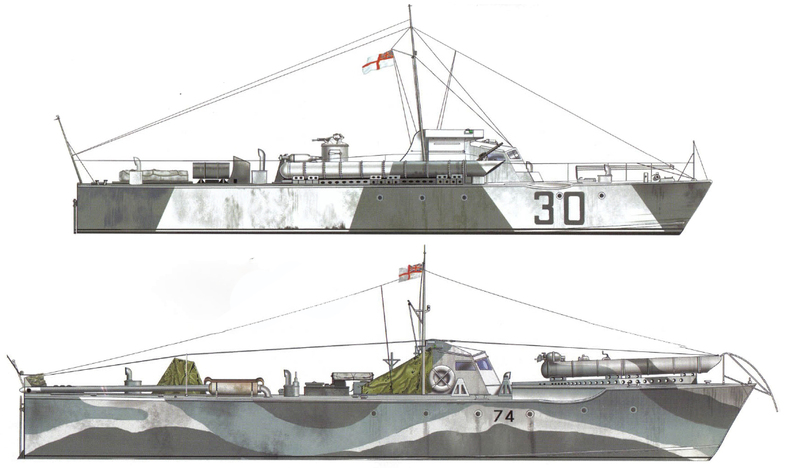 The camouflage patterns shown on these S-Boats can be recreated using the following Army Painter colours, working up from a Ghost Grey basecoast. Electric Blue, Escorpena Green, Dark Green and Monster Brown. If you’re looking to add some extra detail to your ships, we’re releasing packs of crew figures to add to your ships! The post Frontline Report: Camouflaging your Ships appeared first on Warlord Games.